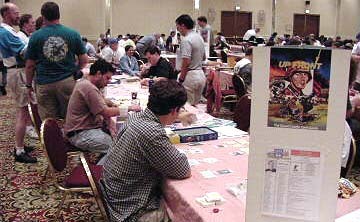 The 2001 Up Front Tournament was a mix of old and new formats, so it seemed only fitting that the finals were also a mix of the old and new. so players double-dipped by entering both heats, 16 different players made it into the knockouts. The twist on the format this year was that fixed scenario/nationality pairs were during the heats, with an effort made to force players to play a variety of scenarios (rather than the basic Patrols and City Fights), and to try and get people to not automatically take the Germans. This mostly worked well (with some glaring excaptions). In the first heat, tournament newcomer Stefan Hess stormed through the field, beating former champions Bruce Young and John Emery. But he was matched by new (to WBC, but not to the Up Front online community) Bruce Wigdor, who also went undefeated through the heats, and beat Stefan at Outpost Line to go to the winner's bracket finals. In the second heat, youth was served with Ray Stakenas II and Erick (son of Bruce) Young coming through the loser's bracket of the knockout. 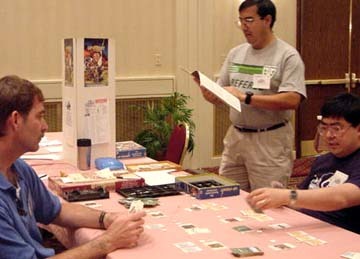 Ken Katano took the honors in the winner's bracket, beating Ray II in a Patrol. The Youngs were knocked out of the loser's bracket, with Erick giving his dad the heave ho for fifth place. Stefan beat Ray II in a nail-biting Patrol to survive the bracket. Bruce Wigdor beat Ken's French in a City Fight to knock him down, and Stefan survived an early Stream/Marsh/Wire trifecta on his fire base to knock Ken out in a Patrol. That set up the rematch in the finals between Stefan and Bruce Wigdor. Again they chose Outpost Line, and again Bruce got the Germans, but this time Stefan tried attacking with the Russians. Stefan's first advance was met with a MTR/MMG 1-2 punch that routed five men. Bruce then "advanced" his MMG into -3 Buildings at chit 1. The Russians gradually fled from a hail of bullets, and Stefan's squad broke late in deck 2 to give Bruce the championship.